3D Modeling in Blender is your guide to the tools and functionality used to create or facilitate the creation of 3D Models in Blender. 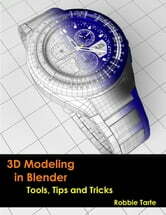 There are plenty of books about Blender and many cover the topic of 3D Modeling. The majority of books only give you an overview of 3D Modeling and teach you just enough to complete a 3D Model before moving on to the next topic. What is often missing is a comprehensive discussion of all the available tools and functionality at your disposal when modeling in Blender. With this book you will get a detailed overview of all the Blender tools and functionality related directly or indirectly to 3D Modeling. Each tool or feature is explained in detail with the help of numerous illustrations. Also included are plenty of tips, tricks and mini tutorials to help you get the most out of Blender.